In this age where the pornographic imagination furnishes a hyperbolized and idealized vision of antiseptically facile sexual performance, it's refreshing to see a movie about a loving couple who can't get it on. Dominic Cooke’s On Chesil Beach proceeds in fits and starts and through flashbacks over the course of a wedding night with the laboriousness of failure brilliantly punctuated and paced by the details of a novelist’s imagination. Ian McEwen who wrote the book on which the film is based (and also wrote the script) interspices references to Uccello and Mozart with pictures of class struggle (an upper crust martinet father and a brain damaged middle class mother are part of the cast) as signposts in his narrative. They define the history of his characters and provide an acute counterpoint to the lucubrations of tortured sexuality. The film has a final act which is as brutal as any scene from Strindberg in which the emotional accounting comes up short. However there's the matter of the epilogue bringing a film that begins in 1963 to its conclusion in 2007. The emotional equation at the movie’s center centers around the female protagonist, Florence’s (Saoirse Ronan) reticence "You're always advancing and I'm always pulling back," she says and when she accedes to her fiancé Edward (Billy Howle’s) demands he's still not happy. It's a perfect leitmotif for a period piece. 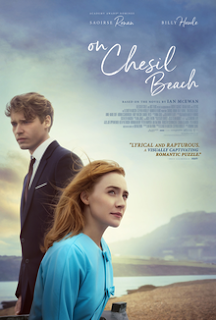 If only On Chesil Beach had encompassed an era rather than a lifetime. By the end, the psychosexual and social elements have reverberations that go far beyond the story of one failed marriage.